When looking for ways to improve your health, we often think first of asking our doctor. Fortunately, nature has provided us with many plants that can give us the same benefits as man-made medicine, with few side effects. The benefits and uses of rosemary essential oil are long and varied, which is why it was considered a sacred herb in the ancient world. There are many ways for you to use it in your own life as well. Many people suffer from hair loss, either due to skin conditions or other health issues. Men and women will appreciate the benefits and uses of rosemary essential oil when it comes to assisting with keeping the hair you have or keeping it naturally healthy. Pharmaceutical treatments for hair loss can result in many undesirable side effects. However, using a natural mixture, which includes rosemary essential oil, can work just as well and as quickly as the standard medical treatment. (1) Rosemary can promote a healthy scalp and relieve any inflammation due to itching. It is even used on patients suffering from Alzheimer’s disease to improve memory recall. This could be an excellent complementary therapy to any pharmaceutical treatments. (4) Rosemary has anti-inflammatory properties which help the brain produce the needed chemicals and soothes the irritated neurons so they can take in the chemicals and hormones to improve memory. It seems that with our work and personal schedules, we live in a constant state of stress. We feel fatigued and operate under a brain fog that keeps us from performing at our best. Many essential oils are known for several properties that bring about pain relief, and rosemary is no exception. Many of the symptoms that accompany pain, such as inflammation, are also improved. With the stress relieving properties found when rosemary is inhaled, you can also relax, further allowing a lessening of the pain and allowing healing to continue. Add about 2-3 drops of rosemary to a teaspoon of carrier oil and rub directly on the painful area. Acne isn’t just relegated to teenagers. These skin problems are caused by a number of problems, such as an overproduction of natural oil, which then clogs the pores in the skin, trapping dead cells inside and allowing bacteria to fester. It also makes a better alternative to the chemicals that fill our cleaning products as well. Add 10 drops rosemary, eucalyptus, and peppermint to filtered water, and you have a spray that you can use directly on your countertops, floors, and even the air to kill airborne illnesses. Rosemary is also used to make homemade hand sanitizers without the drying effect of alcohol. Good for keeping you healthy and better for your skin. I love rosemary. It has to be the most fragrant herb in my kitchen cupboard, and I use on just about anything, from hamburgers to lamb. Employees at the garden center in the home improvement store follow me around because of my strange habit of touching every rosemary plant I see and then sniffing my fingers. I admit I’m weird but happy. Must be some of that mood lifting and mind enhancing properties, even when not concentrated as an oil. The oil has been added to my formula for focus, along with eucalyptus and a few drops of lavender for relaxation. 10-20 of rosemary and eucalyptus in my diffuser and I’m ready to work for hours without stopping or losing focus. I only add about 5 drops of lavender. I find that even a little bit can put me to sleep, but I like the relaxing properties that boost the memory enhancement benefits of rosemary. Not only does it improve my thinking, but it also sanitizes the air with the incredible anti-bacterial properties. The mist also helps disinfect any surface it lands on, so my office is naturally germ-free. I’ve made a spray with rosemary, eucalyptus and orange oil for really getting my surfaces clean in both the office and the kitchen, where it can kill food-borne infections like salmonella. I also make my own hand sanitizer. While I like hand sanitizer for its convenience when you can’t wash your hands, I’ve found that the alcohol dries my skin to the point of bleeding. A recipe of aloe vera gel, vitamin E, witch hazel and an oil blend including clove, rosemary, cinnamon, eucalyptus, and lemon is my new go-to. I leave out the rosemary and make a mix for my kids to use as well. A long list of essential oils with anti-fungal, anti-bacterial, and anti-inflammatory properties makes up the ingredients of this shampoo. Rosemary is used in conjunction with tea tree oil which is good for skin infections and includes vitamin E to keep the skin healthy. It is meant to keep your hair healthy and promote hair growth as well. 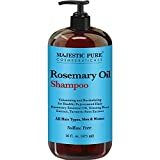 Since rosemary has been shown to have many of the same effects as a popular medical treatment for hair loss, this shampoo may be key to keep what you have, even if genetics are to blame. Rosemary has been shown to help you keep the hair you have, and can even fight scalp infections that can cause dandruff or hair loss. This product is a mix of peanut oil and other essential oils that can soothe the skin as well as help make hair healthier. We tend to do damage to our hair with all the dyeing, blow-drying, and styling we like to do. It can become dry and brittle as we age or if our diet is poor. This oil promises to help keep hair smooth and silky, without drying out your scalp. If your children play with other children, you are always in danger of picking up a lice infestation. And once an infestation hits a classroom, it tends to spread very rapidly from household to household. It’s not caused by dirty hair, but if you’d like to prevent the social awkwardness that comes with being dismissed for lice, this shampoo could avoid the whole mess. Its made with a combination of oils that repel undesirable pests such as lice but is gentle on the scalp and hair like lavender and the carrier oil jojoba, making it gentle and effective. Children 4 and under should not use rosemary. Try frankincense for the same results. Do not use rosemary if pregnant. It could cause uterine bleeding. Use in recommended amounts. Large amounts may be toxic. May cause an allergic reaction in people who have an aspirin allergy. May cause bleeding in persons with blood disorders. Rosemary may cause seizures in persons with a history of seizures or epilepsy. Consult a physician before using. Decreased sperm motility has been observed and may affect fertility in men. Can cause skin irritation if applied directly to the skin. Blend with carrier oils for best results. People with diabetes should use rosemary in moderation as it can raise blood sugar. I hope you find rosemary to not just be an herb to season your dinner. Rosemary was once considered sacred and modern science has helped to back up that claim, showing it is good for your hair and your memory. Please be sure to share this with any students you may know. They may find it helpful as they try to pass their exams.